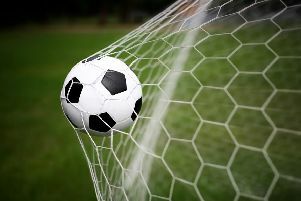 The Rocks left Canvey Island cast adrift with four goals inside the first 31 minutes – and replaced them in third spot after completing a 5-0 rout. Jason Prior bagged another hat-trick and an impressive debut by Chike Kandi – on loan from Brighton – produced a double. The Rocks went into the game in fine league and cup form as Kandi got a start in place of Ollie Pearce who was on the bench. Dan Beck returned to the starting line-up. Canvey were without top goalscorer Martin Tuohy through injury. Leon Gordon’s early right-sided cross for Canvey was too much on the greasy surface for Harrison Chatting. Kandi was straight into the action when his run down the right found him in space before crossing into the box. The cross found Doug Tuck, who struck the ball over the bar. On six minutes, James Crane’s hard work on the left paid off when he found Snorre Nilsen with his cross. The unmarked Nilsen’s header bounced wide. But two minutes later Bognor took the lead. Alex Parsons’ speed beat defenders on the right before he cut the ball back into the area for Prior, who curled the ball low into the net, bamboozling goalkeeper Conor Gough. Crane’s left-sided cross was struck too high for Nilsen on the back post, then Tyrell Miller-Rodney forced Grant Smith into his first meaningful save when his shot with the inside of his right foot was blocked by the goalkeeper on 15 minutes. Parsons’ high hanging cross found Prior on the back post and his shot on the volley was struck low but was blocked. Harvey Whyte tried his luck from outside the box with a low drive but Gough was equal to it on 19 minutes. In a very fast-paced game, Prior’s left-footed strike was cleared then Tuck’s cross found Craig Robson on the back post and his header forced Gough to tip over the bar on 21 minutes. George Sykes found Gordon, who headed the ball only narrowly wide – but on 23 minutes it was 2-0. Parsons’ shot was blocked but on the follow-up the impressive Kandi directed a low shot into the bottom corner. Soon Tuck’s corner from the left had to be punched clear by the goalkeeper – but there were shouts of ‘easy, easy’ from the fans as Prior netted again on 29 minutes. Parsons again was the provider when his hard work paid off as his neat pass picked out Prior, who slotted low into the net. It got better for Bognor as they went four up on 31 minutes. Prior’s long-range low attempt forced Gough into a parried save and it bounced out to Kandi, who deftly chipped the goalkeeper – sparking joy from the home crowd as the ball bounced in. An hour to go – game over. Beck lost the ball in midfield and Miller-Rodney ran through and smashed it from distance. But Smith was there to stop it by diving down to his right. Following a cross by Parsons, Crane fired over the bar on 42 minutes. Prior suffered a cut lip and had to change his shirt on the stroke of half-time. After he was seen to by the physio and changed his shirt, he returned to the field, donning the number 18 jersey. For Canvey, Chatting was replaced by Jake Pitty. One linseman had to also be replaced at half-time because of an injury. Tambeson Eyong fired over the bar shortly after the restart before Kandi hit Canvey on the break – playing in Tuck to set up Prior, who ran on and curled the ball across the face of goal, just out of the reach of Kandi near the back post. Glen Poole received a yellow card for a foul in Canvey’s half on 51 minutes. Poole was replaced by Steve Sheehan on 56 minutes. The Rocks went five up on 57 minutes when a cross from the right found Prior. The striker headed the ball on to the frame of goal and then on the rebound he slammed the ball home off the turf and in to complete his latest Rocks hat-trick. Alfie Rutherford came on for the impressive Kandi on 61 minutes while four minutes later, Prior was replaced by Pearce. Eyong was replaced by John Curran for the visitors. Nilsen forced Gough into a save but it rolled out to Parsons who cut the ball back to Pearce – but he smashed his shot over the bar on 68 minutes. A hard-working performance by Tuck was acknowledged by the home support as he was replaced by Chad Field on 74 minutes. Nice work down the left from Pearce set up Crane inside the box on 79 minutes. But Crane’s shot at goal was blocked by a defender. Curran had the ball in the net on the follow up to a parried save by Smith on 81 minutes but the linesman had his flag up offside. Pitty smashed a deflected shot on goal on 87 minutes but Smith was again equal to it. Field did well to close down Miller-Rodney on a run into the box - then Rutherford smashed wide from outside the box. Parsons won a corner right at the death. Pearce’s kick was headed over by Sami El-Abd, but Bognor had done more than enough to secure the three points. * Next for the Rocks is a Sussex Senior Cup tie at home to Langney Wanderers on Tuesday night.